The Russian and Iranian intelligence agencies have failed in identifying the body/group behind the bomb blast that hit the headquarters of the Syrian national security. The bomb blast is akin to the one that took place in Iran at the beginning of the Iran-Iraq war and killed almost half of the Iranian government’s top officials. Moscow sent its experts to Damascus to examine the blast. They ended up with the speculation that the bomb was detonated remotely. The American Embassy was closer to the site of the explosion than the Saudi Embassy and the latter is separated by high cement walls that can block electronic signals. Damascus and Tehran are obsessed with the conspiracy theory that Gulf states are behind planning and funding of such terror acts. Moreover, the two countries are also obsessed with Bandar bin Sultan. They think Prince Bandar has a firm stand against them and that his close relationship with Jeffrey Filtman and the American political and security institutions posed a threat to them. Prince Bandar’s appointment as the Saudi intelligence chief may mark a new orientation in the Saudi policy. It is worth mentioning that Damascus has alleged over the past ten years about Bandar meddling in Syria’s internal affairs. They even accused him of planning a coup in Syria. In fact, this is the result of phobia and reflects Syria’s internal fear and its attempt to show that there is external threat in order to keep a lid on internal divisions. 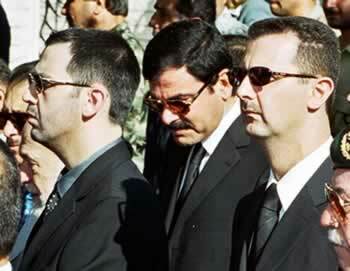 Bandar did not push Assad to assassinate former Lebanese Prime Minister Rafik Hariri in February 2005. The “Bandar obsession” that has haunted the Syrian regime is being used by it as a pretext to justify its failure in handling the Deraa crisis. The Syrian leadership claims that the crisis was triggered with the support of Bandar bin Sultan. News outlets linked to the Iranian and Syrian agencies launched the smear campaign to defame Bandar. Filka Israel, a website run by Khudar Awarkah, who is close to Hezbollah and the Syrian intelligence fabricated stories about the mechanisms employed by Bandar and Jeffrey Filtman to remove Assad from power in 2008. Anyone who may have read this diatribe will come to the conclusion that Bandar possessed exceptional talents! But the success of any intelligence work depends on weaknesses inside the targeted country. The Syrian uprising took place because of corruption, repression, excessive use of power and marginalization of the Syrian citizens. The situation aggravated when Assad gave Iran a free hand to meddle in Syria. In fact, Syrians had to keep silent due to Syria’s repressive policies and amid heavy Iranian interference. Thierry Meyssan wrote on his Voltaire website about differences that led to the appointment of Prince Bandar bin Sultan as the Saudi intelligence chief. Usually there is a lot of fabricated news about personalities of Bandar’s caliber and that has been the case now. But Prince Bandar has never responded to such reports and is not affected by them. The French leftist, Thierry Meyssan, has cultivated close links with the Iranian and Syrian intelligence agencies. He left his country and moved to live in Beirut under the protection of Hezbollah. He wrote about the terrible event of Sept. 11 in a book entitled "The Frightening Deception," and he wrote another book on the destruction of Lebanon. The Iranian messages are obvious as the basic arguments in these two books are: Defending Iran and criticizing the Gulf countries and accusing them of being behind terrorism. Last week, Thierry Meyssan wrote on Voltaire that Prince Bandar was killed along with his assistance Mishaal Al-Qarni in a bomb blast on July 26. The same day, Prince Bandar appeared with Prince Khalid bin Sultan at a function. He was also present at the Custodian of the Two Holy Mosques' reception for princes in Jeddah. This shows that the propaganda against Prince Bandar only aims to stir instability and anarchy. Thierry Meyssan's tirade is a part of the Iranian and Syrian propaganda. He was directed to write this fabricated story in response to the bomb blast that killed top Syrian military officials. During the Iran-Iraq war, Tehran used to announce the killing of top Iraqi leaders almost daily. But we were surprised to see those people on TV later and that exposed the Iranian propaganda. All websites are waiting for a denial or confirmation of the reports by the Saudi government. But this is not going to happen and Prince Bandar will not appear unless it is required for political and security reasons. The Iranian and Syrian propaganda and their media outlets will be exposed. We have read a lot of comments and articles on Bandar when he was an ambassador and a senior official in the national security agency and we never found a single comment as a response from the prince. The prince is a very dynamic yet calm person. He enjoys strong and influential relationships with the decision makers in several countries around the world. A comment in reaction to the Syrian lie about the assassination of Bandar by a Saudi citizen read: “Your presence has scared them even before you have started your work.” Another wrote, "Bashar, just stay with the Free army." In the early days of the conflict, Tehran sent some 40 experts in electronic warfare to Damascus. During this period, electronic website mushroomed with the aim of spreading false and fabricated news. They mostly accused the Gulf countries and talked about the battalion of Hamad Bin Jassim and the scheme of Bandar bin Sultan. To gain credibility, these websites also published news not favorable to Assad. There are a number of questions: Why do states look for external enemies when they fail to deal with their societies? Why do they try to convince their people that they are victims of a world conspiracy? Why don’t they confess that they are the ones who push their people to ask for help from outside? How much money is spent abroad to uphold the legitimacy of Assad? Why does Iran insist on Assad’s survival in a way that is against the wish of the Syrian people? Unquestionably, the appointment of Prince Bandar has been the focus of political and security circles in Iran, Syria and Moscow. Their reading is based on the reality that his appointment is the precursor of upcoming developments that will take place in months. In brief, the appointment of Prince Bandar has caused hysteria and confusion among the Syrian and Iranian circles.